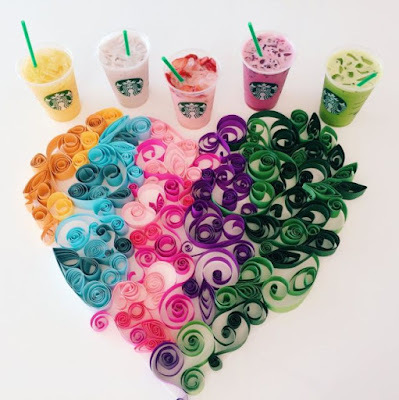 Starbucks Orange, Purple, Blue, Pink, and Green Drinks (AKA the Rainbow Drinks) have garnered quite a following on social media recently (try a search for #orangedrink on Twitter or Instagram for example) so that the company recently posted the recipes for each of the drinks on their social media channels. - Orange Drink - Orange mango juice with vanilla bean powder and a splash of coconut milk. - Purple Drink - Iced Passion Tango Tea with no water, sub soy milk, vanilla syrup and blackberries. - Blue Drink - Iced Passion Tango Tea with no water, sub soy milk and vanilla syrup. - Pink Drink - Strawberry Acai Starbucks Refresher with no water, sub coconut milk. - Green Drink - Iced Black Tea with no water, sub coconut milk and matcha. Note: I would not recommend ordering them by name as they are not "official" menu items and your barista might not know what you're talking about (I would also point out that sometimes you can order official menu items and your barista still might not know what you mean).